On March 23, 2015, The New York City - Southern New York Chapter of the National Multiple Sclerosis Society announced the winners of the 19th Annual Books for a Better Life Awards during a ceremony at The TimesCenter in Manhattan. Hosted by television personality Meredith Vieira the evening also featured the induction of Dr. Mark Hyman, founder of The UltraWellness Center and director of The Cleveland Clinic Center for Functional Medicine, and Mark Tauber, Senior Vice President and Publisher of HarperOne, a division of HarperCollins Publishers, into its Hall of Fame. Award presenters included Katie Couric, journalist, author and Yahoo News Global News anchor, and best-selling author Lee Woodruff. The ceremony also recognized Ali Salama, Group Advertising Director at Bloomberg Media, with the MS Mission Spotlight Award presented by Biogen Idec. Salama, an 18-year veteran of the advertising/publishing industry, has been living with multiple sclerosis since 2009, and is an active participant and fundraiser of National and chapter events. 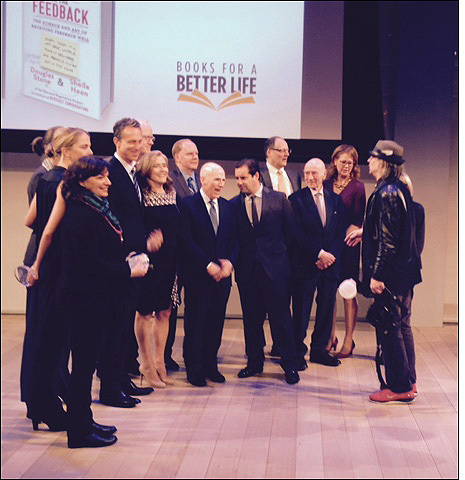 Since its inception in 1996, the Books for a Better Life Awards has recognized more than 700 self-improvement authors and raised more than $2.1 million for the New York City - Southern New York Chapter's comprehensive support services and educational programs for people living with MS, their friends and families as well as the Society's critical research initiatives. The New York City - Southern New York Chapter of the National MS Society is committed to helping the 12,000 people living with multiple sclerosis in the five boroughs and Westchester, Putnam, Rockland, Orange and Sullivan counties continue moving their lives forward. The chapter raises funds locally to support the Society's critical research initiatives and to provide hundreds of comprehensive support services and educational programs for people living with MS, their family and friends. For more information, visit www.MSnyc.org. The Society mobilizes people and resources to drive research for a cure and to address the challenges of everyone affected by MS. In 2014, the Society invested $50.6 million to advance more than 380 research projects around the world in order to stop MS in its tracks, restore what has been lost and end MS forever. Through its comprehensive nation-wide network of programs and services, it also helped more than one million people affected by MS connect to the people, information and resources needed to live their best lives. Join the movement at nationalMSsociety.org.